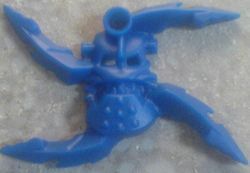 Vezok Spinner is a BIONICLE promotional set released in 2006. It was exclusive to Nesquik cereals in Mexico and Spain. It included a blue Vezok spinner and two cardboard Toa Inika targets to throw it at. This page was last edited on 10 January 2016, at 01:01.